You might remember the Rainbow Six series from Ubisoft, a third-person squad based military shooter first created by the late Tom Clancy as part of his diversified portfolio. 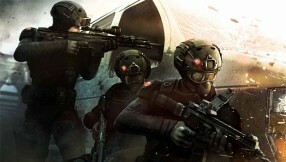 You might also remember an announcement from Ubisoft concerning the latest game in the series, Rainbow Six: Patriots. The 2011 version of the title that was shown to the world was simply “not good enough” according to Ubisoft, so they decided to start over. The latest version of the game is aimed for a Xbox One and PS4 release, while the previous unfinished iteration was a PC, Xbox 360, and PS3 only title, Ubisoft North America president Laurent Detoc told IGN in a new interview. Detoc explained how the development team just simply had to remake the game, but he did not provide specific details as to what is different now from the original. Detoc also said that the team over at Ubisoft Montreal, who are also getting assistance from Ubisoft Toronto and Red Storm, will benefit from utilizing the new consoles. Detoc chose the word if, as to indicate the game might never even come out in the first place. But it’ll interesting to actually see the new version of the game in action after a 3 year absence.